“On track” or “probably not enough”? 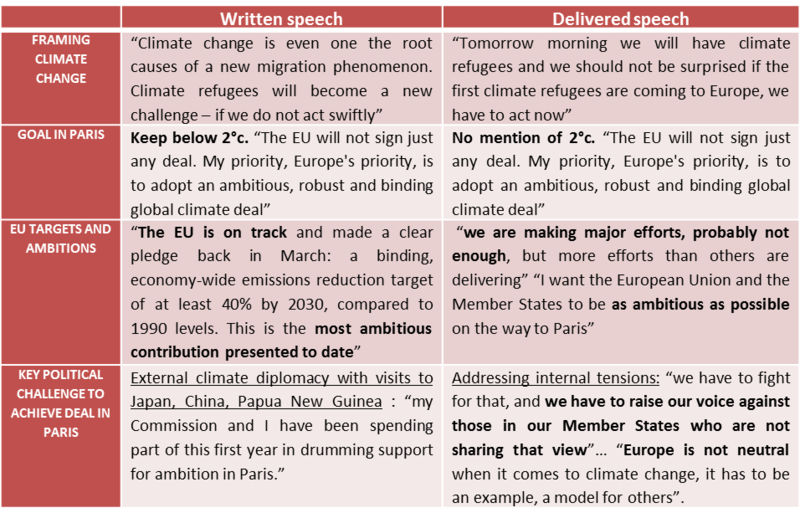 EU climate policies in Juncker’s first State of the European Union address | Environmental Europe? Last Wednesday, Jean-Claude Juncker delivered his first State of the European Union (SOTEU) address. This speech – the longest since Barroso started yearly SOTEU back in 2010 – is a key agenda-setting moment for the Commission President, providing the opportunity to set out a personal vision on the major issues facing the European Union today. While most media coverage focused on how Juncker grappled with the refugee and economic crises, this post sheds light on whether and how EU environmental and climate policies figured in the address. Looking at the environmental side of the speech is key for two reasons: first, since the very start of his Commission, Juncker has been criticised as side-lining environmental issues (in his Commission’s architecture, through his continuation of REFIT, etc.). Second, with the Paris Climate Summit (COP21) only three months away, the European Union (and the Commission in particular) will have to swiftly decide whether it wishes to remain a leader on climate change – or whether it is unwilling to bear the costs associated with leadership (e.g. maintaining credibility through well-functioning internal policies, well-funded external support for developing economies etc.). A speech exists in two forms – the planned, written words, and the actual spoken words delivered on the day. Difference between the two is common, but the delivered version trumps the written one. The two versions are widely different when it comes to Juncker’s treatment of environmental issues. Hence, Jeremy Wates (EEB) drew attention to how the strong environmental rhetoric on how “the planet we share (…) cannot cope with the use mankind is making of it”, present in the written version of the speech was not delivered. Similarly, mentions of ‘sustainability’ were left out of the spoken version. This, Wates argued, shows that the environment is simply not high enough on the Commission’s agenda – when pressed for time, Juncker had no calms remaining silent on the topic – in 9929 words, he never mentioned ‘environment’. Yet, looking in details at what Juncker said on the Paris negotiation reveals a more complex picture. Hence, while Juncker remained silent on general environmental issues (biodiversity, sustainability, pollution etc.) he chose to speak about climate change – highlighting a narrowing down of what environmental issues are considered relevant, or highly salient by the Commission. Furthermore, Juncker did again depart from his written speech when talking about Paris, but far from toning down his environmental rhetoric, he was more frank, and crucially, more critical of EU action. 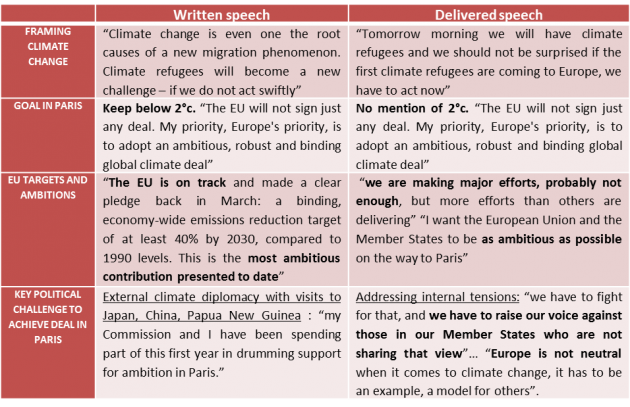 The two versions show significant overlap – links between climate change and the on-going refugee crisis, need for a binding deal in Paris – but Juncker’s written speech is much more positive on the EU’s ability to lead on climate change. Instead, the actual, delivered speech, draws attention to remaining tensions within the EU, and the need to drum up support not only outside of the EU’s borders but within them. Recognising that the EU’s contribution is “probably not enough” is also a major departure from conventional EU rhetoric of climate leadership. But what does it mean? Should we read much into it? Does it indicate a split within the Commission, which would see Juncker as the (unlikely) proponent of greater ambition – or a simple slip of the tongue? Timing is key – Juncker said he wanted “the European Union and the Member States to be as ambitious as possible on the way to Paris”: now is the time to put these words into action. Finance ministers were asked to consider their level of climate finance on Tuesday and Environment ministers are meeting this Friday to discuss the EU’s negotiation position – we will soon find out whether Juncker and his team are serious about further ambition and tackling internal divisions. This entry was posted in Current Affairs, Energy & Climate Change, Environment, Global & International, Politics & Public Policy and tagged climate change, COP21, Juncker, SOTEU. Bookmark the permalink. “in 9929 words, he never mentioned ‘environment’”. Wow, that cannot be put down to a mere ‘slip of the tongue’. It plays into the hands of those who argue that the Commission is no longer interested in pursuing an ambitious environmental policy. We are living in interesting times….